Eating a clean diet means eating whole foods and avoiding animal products, soy, alcohol, sugar, caffeine and gluten. Clean eating is a way to cleanse and give your body, and specifically liver, a break from processing these products. Spring is a great time to spring clean your body and try a clean eating detox for a few days! You can eat any real whole foods when doing a cleanse. Stay away from processed food and stick to vegetables, fruits and brown rice. Make sure to drink plenty of water throughout the day. Adding herbs and teas will help add some flavor and make you feel more satisfied. I found a great regimen when reading my Whole Living magazine that I wanted to share. Follow these meals and snacks to give your body a rest for a few days. The main meals are 3 servings worth, so you can make them all up front and have your clean eating plan for the next three days. I bought most of the ingredients, with a few substitutions/omissions if I could not find what I was looking for. Three days worth of food for two people – that’s a lot of vitamins! Breakfast: a smoothie made of 1 grapefruit, 2 cups fresh or frozen strawberries, 1 apple, 1 inch fresh ginger, and 1 cup water. Finished smoothie! 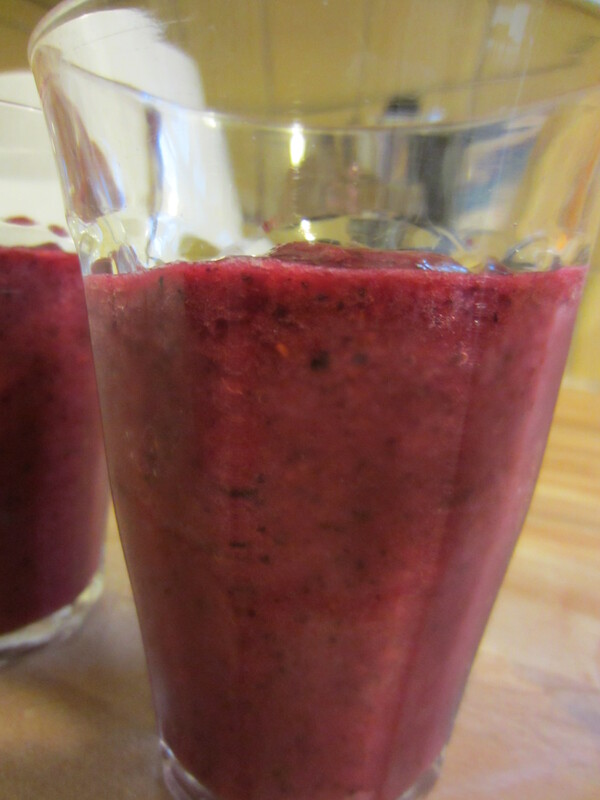 I used blueberries and raspberries in mine instead of strawberries. Lunch: salad with beet slaw. 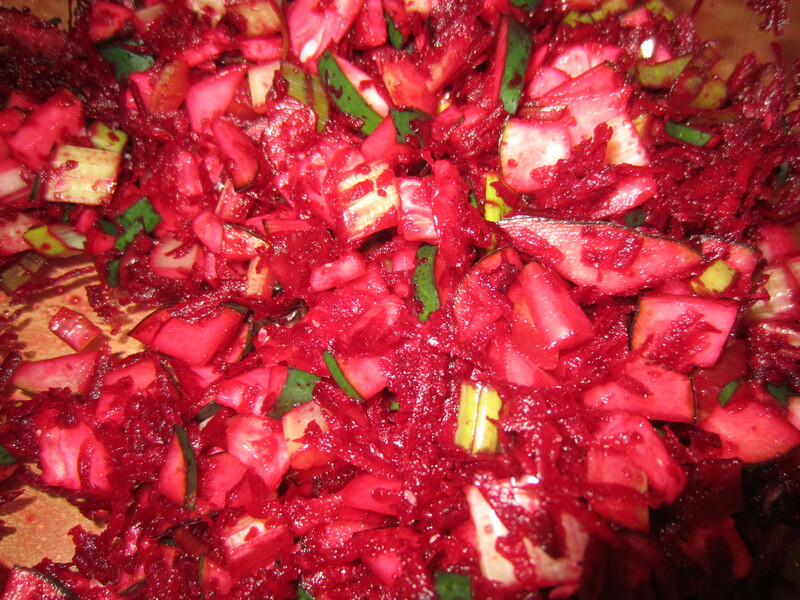 Prepare the beet slaw first and re-use over the 3 days. Toss 2 thinly sliced beets, 4 stalks of celery, a cucumber, and two scallions together. Each day mix the beet mix with a cup of arugula, some olive oil, lemon juice, salt, pepper, half an avocado, and three tablespoons of sunflower seeds. 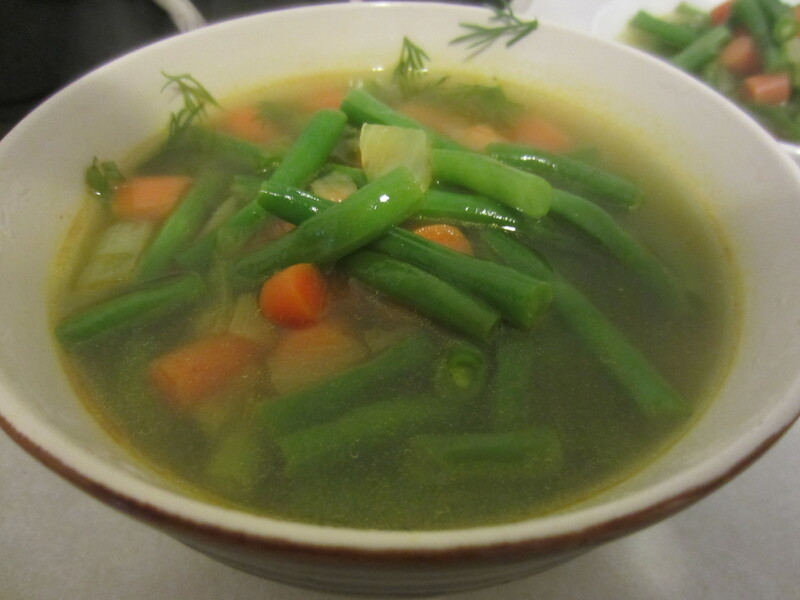 Dinner: carrot-spinach soup with dill. Make the base as a batch for the 3 days: cook an onion in 3 Tbsp. of oil, and then stir in 7 diced carrots, ¼ tsp. turmeric, and some sea salt. Then add ten cups of water, bring to a boil, and simmer for 30 minutes. Add a pound of green beans and cook until just tender, about 2 minutes. 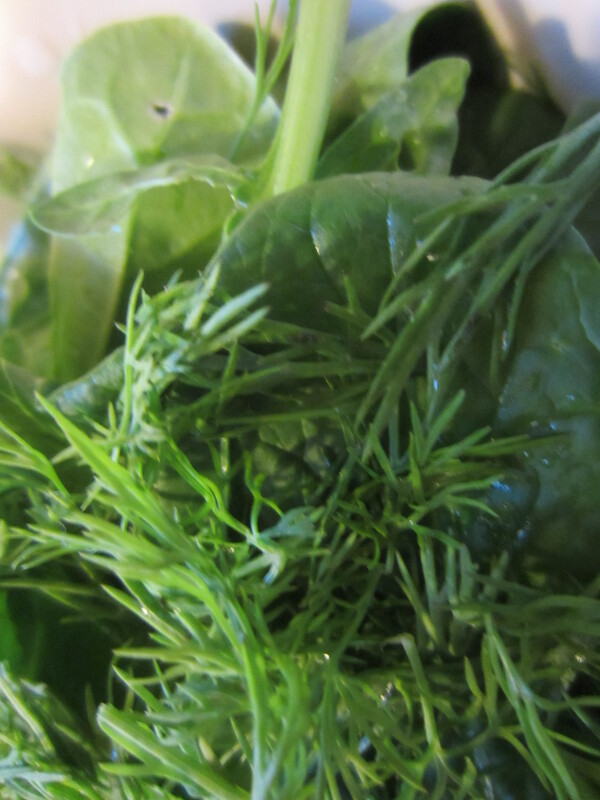 To make a serving each day, fill a bowl with a cup of spinach and three tablespoons of dill, then ladle three cups of hot soup base over the greens, cover and let steep for five minutes, and add 2 Tbsp. lemon juice. The regimen in Whole Living also recommended having two snacks a day. Avocado rolls: mix one cup watercress, a carrot, ten mint leaves, and half an avocado. Roll into a halved cabbage leaf. Slice an apple and drizzle a tablespoon of tahini over it. Freeze a peeled and chopped banana and puree in a food processor, then top with 1 Tbsp. almonds. Serve radishes topped with dressing of 2 Tbsp. olive oil, 1 tsp. chives, and ¼ teaspoon each salt, lemon juice and zest. Collard chips: drizzle 1 Tbsp. olive oil over six collard leaves torn into small pieces. Season with salt and bake at 300° until crisp – about 15 minutes. I plan to eat almonds and steel cut oats as additional snacks if I get too hungry restricting myself to the plan. Today was day one and I was able to stick to the plan! Although I don’t feel as satisfied as I do when I eat meat, it’s nice to give my body a rest. 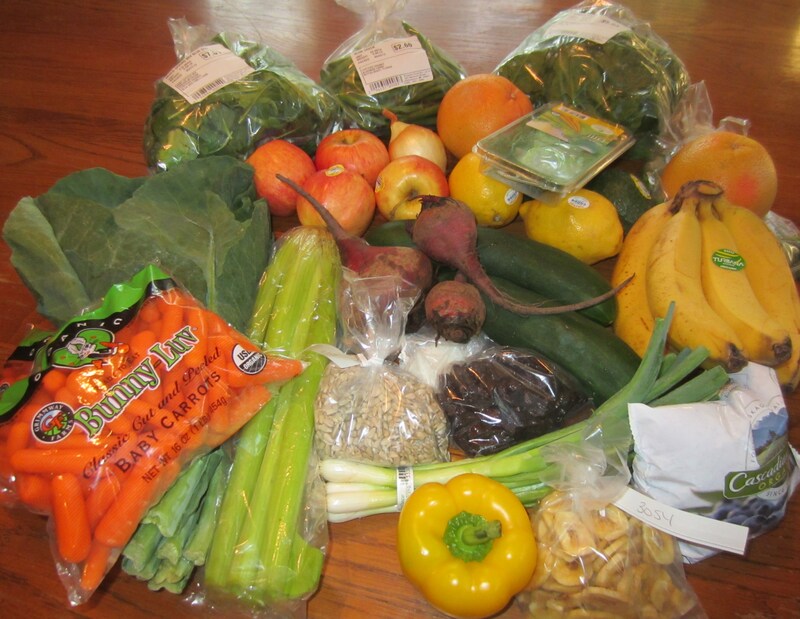 Why don’t you consider doing a few days of clean eating to help your body detoxify? 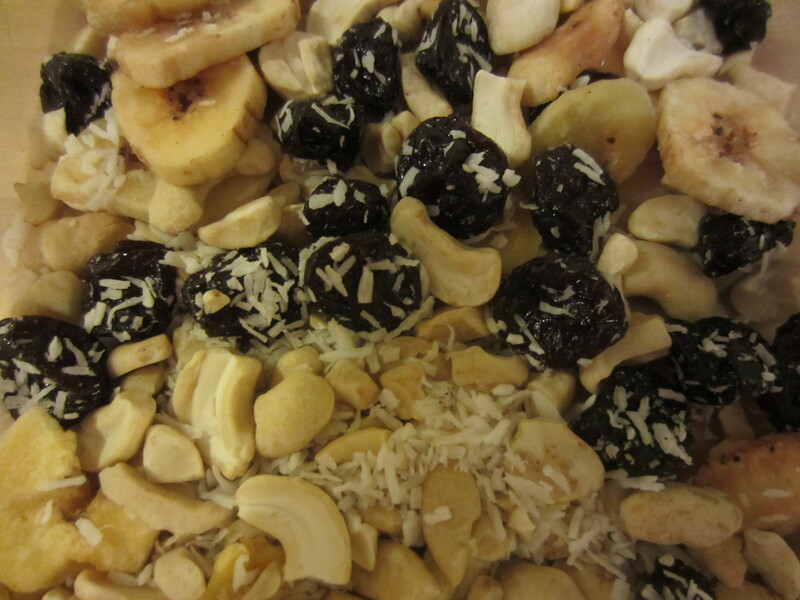 This entry was posted in Nutrition and tagged clean, cleanse, detox, spring, whole food, Whole Living by Tina's Pharm. Bookmark the permalink.